An American kidnapping by terrorists in Beirut sets off a brutal tug of war between the US Government and the Media - and a wife caught in the middle. Named "Best Play of the Year" in 1988 by Time Magazine. Starring Alexnadra Hellquist, Justin Hoch, Logan Keeler, and Lila Smith. Directed by Brandon Walker. After an American teacher is held hostage in a windowless cubicle in the Middle East, his wife, Lainie, finds herself (and the US Government) powerless to do anything about it. In order to symbolically share his ordeal, she strips a room in their home bare and holds a vigil for him until she can garner enough media attention to strong-arm the State Department into action. As Michael’s life hangs precariously in the balance, Lainie must deal with a story-hungry reporter and an emotionally detached bureaucrat while hoping to find a way to reconnect with her husband. Named "Best Play of the Year" by Time Magazine in 1988, TWO ROOMS is a revealing portrait of solitude and devotion reverberating with everyday headlines - a love story interrupted by the things we most try to ignore. TWO ROOMS is presented by special arrangement with DRAMATISTS PLAY SERVICE. This production has been made possible by the generosity of our community sponsors: Ardesia Wine Bar, Bamboo 52, Barcelona Bar, Columbus Hardware, Kashkaval Garden, Matt's Grill, Noodies Thai Cafe, Pick-A-Bagel, Route 66 Cafe,Valhalla, and Westerly Liquor. Howard Miller, Talkin' Broadway - "Revivals of two one-act plays about the collateral damage of war (especially on the ones who are left behind to deal with the consequences) make for a deeply compelling and richly provocative theatrical venture in The Seeing Place’s paired productions of Christopher Shinn’s Dying City and Lee Blessing’s Two Rooms at ATA’s Sargent Theater. Whether you see them on separate days, or, as I did, in back-to-back performances, you will find much to admire and be disturbed by in Dying City, and much to empathize with and be disturbed by in Two Rooms. The two plays could not be more different in style, but seeing them together will feed both your head and your heart, making for striking variations on a theme of how we all strive awkwardly and clumsily to make the right decisions in order to keep our noses above the waterline...The pairing of these two plays was a smart decision by The Seeing Place, which has been steadily growing in terms of the overall quality of the acting and in its increased understanding of production values in the five years of its existence. Both the lighting and of music are very effective in these productions, and such attention to detail greatly enhances them. It was nice to see a packed house on the day I attended, and I hope this means the always-interesting company is drawing well-earned attention to its work." Ryan Hudak, New York Theatre Review - "An event unlike anything you've seen before...How does one find hope in the midst of ongoing warfare and grief? 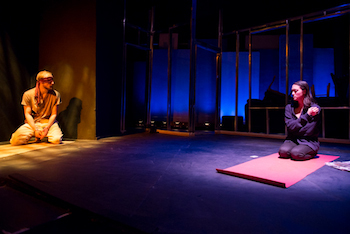 That question is at the heart of The Seeing Place Theater's powerful rep production of Christopher Shinn's Dying City and Lee Blessing's Two Rooms. Both plays were written years apart, and yet when paired together, the combination is beautiful and emotionally brutal...As an ensemble company, these people have been working together for years, and that history enhances the work...Lila Smith delivers a striking performance in Two Rooms, bringing a smooth exterior to a government official who has learned to bury the pain that her job inflicts on her. Logan Keeler is haunting as Michael, using his voice and body to give his speeches an otherworldly quality...The Seeing Place had done something very special, placing two separate works together to hit at the mind and the heart. It will leave you with a lot of questions about how this country has and continues to handle the situation in the Middle East. But it doesn't give answers—and in theater that is always a blessing. Theater that provokes debate can be rare, but it’s thrilling when a theater company like this makes that leap with great skill." Scott Mitchell, Reviews Off Broadway - "Two Rooms is fresher than ever...You quickly forget this play was written 25 years ago. The specifics of danger have changed, but the complexities of the Middle East, the impotence of the State Department, the motivations of the press and the government are as immediate today as they were in 1988. And the heartbreak conveyed by Ms. Hellquist as Lainie is powerful in any era...These two aching shows leave you determined to make every second count. And the seconds spent at these two shows are well worth the time." Chris McKittrick, Daily Actor - "In recent years The Seeing Place has been pairing plays by different playwrights with thematic similarities together in repertory. Through hard work and persistence they have been granted the rights to a number of acclaimed plays, and the current productions maintain that high quality of material...While in the past I’ve often been most impressed by The Seeing Place’s work with large ensembles, with Dying City and Two Rooms the company presents two one act plays with small casts in rotating repertory that equals their notable work with far larger casts...Smith deserves a heap of credit for portraying a character who is at times is calculating and at other times shows degrees of warmth. It would be easy to present Ellen as a two-faced bureaucrat, but Smith portrays her on a fine line between true emotion and professional necessity...Hoch carefully tows the line between hero and villain. Keep your eyes on him for the quizzical ways he reacts to Lainie and Ellen’s words – his character might be louder, but Hoch effectively hints that Walker is even more deceitful than Ellen is at her worst...It’s doubtlessly difficult to express oneself when you are blindfolded, handcuffed, and confined to twelve square feet of space on the stage. On top of that, most of Michael’s dialogue is in monologue. Because of that, Keeler has both a challenging and thankless role, a one-man show alongside a just-as-compelling three-person play...Hellquist makes this torment apparent without making it too obvious. Her character struggles – between hope and reality, optimism and pessimism, fear and desire – that it is doubtlessly emotionally draining...As usual with the productions done by The Seeing Place, I strongly recommend seeing what’s happening onstage at this little theater in Hell’s Kitchen." Anthony Giordano, Stage Buddy - "Set against the internal struggles of the Middle East and portraying both individual and government responses, "Two Rooms" weaves some tender moments between the hostage and his wife between the realistic and often harsh diplomatic steps necessary in such situations...If you’re up for an evening of thought and debate interspersed with tenderness all portrayed by four excellent actors, see 'Two Rooms'." RC, Patron Review, Time Out NY: "Saw TWO ROOMS last night. Wow! We'll definitely be back to see DYING CITY. This company does an amazing job of making you think and feel like you're right there in the room with these real people. All four actors were phenomenal. They are just as good or even better than a lot of what we've seen on Broadway, so to get to see this kind of quality acting for only $12 is a steal! Highly recommend it. We're definitely new fans of The Seeing Place." Bobbi J, Patron Review, Time Out NY: "I saw The Seeing Place Theater's production of "Two Rooms" this past weekend and it was terrific! The acting was phenomenal. The pathos and emotion between Micheal (Logan Keeler) and Lanie (Alexandra Hellquist) was touching and palpable. Despite the existentially bare stage, you were drawn into their grief and light intimate moments as you watched them cling desperately to each other's spirit while trying to navigate through their new reality. I felt the absolute love that they had for one another. Both Mr. Keeler and Ms Hellquist displayed a wide and believable range of emotions. Michael’s frustration with his unending captivity was reflected through his tears, frustrated laughter and transcending fantasy. One could not help but connect to Lanie’s strength of character as she struggled to work through her frustration, tears, confusion and ultimate loss. Walker (Justin Hoch) played the perfect reporter. His conflicted emotions were so evident, yet restrained. Ellen (Lila Smith) nailed her role as the face of the government; at once promoting and apologizing for the government’s actions that were non-actions and failures that were successes. The ending was inevitable but shocking nevertheless and left you breathless. I remain in awe of the level of talent in this theater group. Theater does not get any better than this." 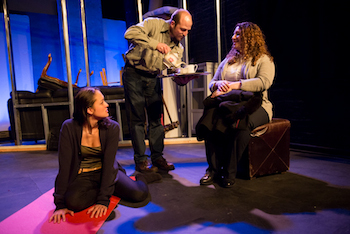 Emily N, Patron Review, Time Out NY: "Once again, the Seeing Place has produced two well-acted, fascinating plays. There isn't a thing I would want changed about these productions - the actors gave terrific performances, and as with the Seeing Place's other productions, I know I'll often think about these characters and their stories. I strongly recommend these plays!" Beth Ann Ashford, Patron Review, Time Out NY: "Witnessed a performance by Alexandra Hellquist last evening that was simply "over the top". Ms Hellquist stars in "Two Rooms" and to my suprise, hasn't asked her Agent to witness the performance...WhY? She doesn't have an Agent. If you happen to be an agent-- looking for a truly talented actress---Go and see her!!" CB, Patron Review, Time Out NY: "Saw Two Rooms last weekend. A gripping performance with true emotion. A great choice for drama buffs as well as visitors to NY looking for a solid choice." Bettie Laven, Patron Review, Time Out NY: "Riveting! Go see it!" Jessica Jolley, Patron Review, Time Out NY: "Saw 2 Rooms last night and was unbelievably moved by the story and amazed by all performances! I will definitely be back to see Dying City! The theater was small and intimate and made you feel like you are apart of the performance. Absolutely lovely." Lyndsay, Patron Review, Time Out NY: "Saw Two Rooms tonight, and it was EXCELLENT! I actually plan on going again, it was powerful and provoking and really makes one think about how Americans are seen in other countries. The acting was phenomenal, all the characters felt real. I would definitely recommend seeing this play." Mark, Patron Review, Time Out NY: "I saw both shows, "Dying City" and "Two Rooms". Highly recommend both plays. Fantastic performances by all. Very compelling and heartfelt pieces. I left the theatre with much to think about. Very emotional. Heightens an awareness in the human condition and our world affairs. Troubling but necessary to confront." Jacqueline Parker, Patron Review, Time Out NY: "This interesting juxtaposition of plays provided a fulfilling, thought-provoking afternoon that would be difficult to match even in this culture-loaded city. There were both well performed and directed, and each moving in its own way. The company is young, earnest and always welcoming and eager to do their best. This is a refreshing respite from other groups that don't understand that audiences must be cultivated with intelligent offerings and a smile." David, Patron Review, Time Out NY: "Two excellent shows. We saw them together, and it was very moving. A great troupe"
Logan Keeler (as Michael Wells) joined The Seeing Place Theater in August. This is his second show with the group following the opening of their 5th season with MEN IN WHITE as Dr. Pete Bradley in November. Recent productions include THREEPENNY OPERA (The lost Theater, London) as Mr. Peachum, NEXT TO NORMAL (Stranger Productions, Boston) as Dr. Madden/Dr. Fine, HARVEY (Connecticut College Theater Department) as Elwood P. Dowd, and his Off-Broadway debut as Bernie Bartok in the first revival of MONEY: THE MUSICAL. Logan is a graduate of Connecticut College and The William Esper Studio in New York City and studied at The British American Drama Academy in London. He enjoys playing acoustic guitar, sketching and is slowly teaching himself mandolin. He lives in Brooklyn. Alexandra Hellquist (as Lainie Wells) is a multi-ethnic mutt who loves the stage, screen and everywhere in-between. Favourite NYC stage collaborations include The ECC's ODD.A.SEE, Zootopia's THE WHY OVERHEAD, The Ume Group's BUTOH ELECTRA, Depth Charge's BUTTERFLY, BUTTERFLY, KILL-KILL-KILL!, and Extant Arts' CORNER POCKET. Film leads include the Netflix ninja episodic "Shinobi Girl", Rohit Gupta's "Midnight Delight" and Sean Manzione's "Seed Sprang!.... ".To Michael, whom she loves. See more at www.alexandrahellquist.com and imdb.me/alexandrahellquist! Lila Smith* (as Ellen Van Oss) is so proud to be making her debut with The Seeing Place. She is a born and raised New York City girl, whose professional performing experience in the last five years has mostly been in other states, so it’s great to be performing this close-to-home material on a home-city-stage with this incredible cast and crew. Lila is also Co-Founder and Executive Director of Shakespeare Anywhere, an event services company with a focus on classical performance talent. Proud member of Actors’ Equity Association. Brandon Walker* (Director/Producer) is an NYIT nominated actor for his work in The Seeing Place's DANNY AND THE DEEP BLUE SEA. Other previous shows with The Seeing Place: MEN IN WHITE (Dr. Ferguson); HAMLET (Hamlet); ROSENCRANTZ AND GUILDENSTERN ARE DEAD (Hamlet); A LIE OF THE MIND (Jake), LOVE SONG (Beane), THE CREDEAUX CANVAS (Winston), WHEN WE HAVE GONE ASTRAY (Ira), WAITING FOR LEFTY (Sid), LOOK BACK IN ANGER (Jimmy), TWELFTH NIGHT (Malvolio), CLOSER (Dan), THREE SISTERS (Andrey), and THE LOVER (Richard). He has worked with The Old Globe, La Jolla Playhouse, Poor Players, New Village Arts, Moxie Theatre, ion Theater, North Coast Rep, Sierra Rep, and Barnstormers Theater. Member AEA. Training: David Gideon. Such a joy to share the stage with both glorious ensembles – special thanks to Erin Cronican for keeping me from going mad. Meg Grujon (Assistant Director) is excited to be working on her first production with The Seeing Place Theater! Past directing credits: FIVE WOMEN WEARING THE SAME DRESS (TRG Productions), MISSPELLED and THESEUS 2.0 (Coffee Black Productions). Her acting credits include: INTELLECTUAL PROPERTY (Playlab NYC/Coffee BlackProductions) and SNAPSHOT: A DRAMATIC ANTHOLOGY (AlphaNYC Theatre Company). She has done several student films, as well as her first feature film, "Downcast" filmed in Portland, OR. She is a proud graduate of Marymount Manhattan College. Elle Emerson (Stage Management) is originally from Southeast Missouri. She graduated from Arkansas State University with a Bachelor of Fine Arts in Theatre. She enjoys stage, film, and improvisational acting as well as directing. Her favorite roles include Hermia from Shakespeare's A MIDSUMMER NIGHT'S DREAM & Callie from an independent film adaptation of STOP KISS. Elle enjoys staying as busy as possible. She is the Production Manager for The Seeing Place Theater, in addition she is interning for the Katra Film Festival and Emerging Talent Agency. Most recently Elle played the role of Julie in an episode of Lion TV's show "Deadly Devotions." Erin Cronican* (Producer) Previous shows with The Seeing Place: MEN IN WHITE (Laura Hudson/Director); HAMLET (Ophelia/Co-Director), A LIE OF THE MIND (Beth), MISS JULIE (Director), LOVE SONG (Molly/Director), DANNY AND THE DEEP BLUE SEA (Roberta), THE LOVER (Sarah), CLOSER (Anna), THREE SISTERS (Masha), LOOK BACK IN ANGER (Helena) and TWELFTH NIGHT (Maria). Regional favorites: THE LAST FIVE YEARS, ANGELS IN AMERICA, WIT, SUBWAYS ARE FOR SLEEPING, and EVITA. She has appeared on “Veronica Mars,” and “One Life to Live,” and can be seen in Paul Giamatti’s film, “Cold Souls” (among others.) Special thanks to this amazing ensemble and especially to Brandon Walker who will always be her favorite leading man. Proud member of AEA & SAG-AFTRA. Learn more at www.erincronican.com.